The fun and easy way® to become a more efficient, effective reader! Want to read faster  and recall more of what you read? This practical, hands-on guide gives you the techniques you need to increase your reading speed and retention, whether you're reading books, e-mails, magazines, or even technical journals! You'll find reading aids and plenty of exercises to help you read faster and better comprehend the text. Part I: Introducing Speed Reading. Chapter 1: Of Course You Can Speed Read! Chapter 2: It’s All about Breaking Bad Reading Habits. Chapter 3: Understanding the Mechanics of Speed Reading. 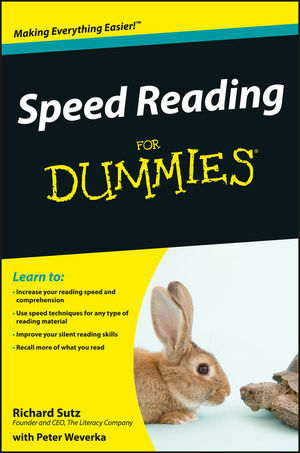 Chapter 4: Introducing Speed-Reading Fundamentals. Part II: Focusing on the Fundamentals. Chapter 5: Establishing Your Reading Rate. Chapter 6: Taking in More than One Word at a Time: Reading in Clumps. Chapter 7: Getting the Gist from Word Groups. Part III: Advancing Your Speed-Reading Skills. Chapter 8: Building Your Speed-Reading Momentum. Chapter 9: Exercising Your Ability to Read More in Even Less Time. Chapter 10: Other Reading Strategies to Supplement Your Speed Reading. Chapter 11: Taking Advantage of Writing Structure to Read More Quickly. Part IV: Improving Your Comprehension. Chapter 12: Expanding Your Vocabulary to Become a Better Speed Reader. Chapter 13: Applying Speed Reading to Various Reading Tasks. Chapter 14: Ten Quick Techniques to Improve Your Reading Speed. Chapter 15: Ten Exercises for Keeping Your Eyes Speed-Reading Ready. Chapter 16: Ten Tips for Making Your Speed-Reading Skills Permanent. Appendix A: Uncovering the Prime Words. Appendix B: Your Speed-Reading Progress Worksheet.